The thought of summer seems so long ago now that the school is in full swing. I stop now to think back to the glorious days of summer. This past summer was full of learning. I read books, blogs and checked out all of the wonderful sites my PLN had shared every day. Each day was packed with great discoveries. So I started making a list of things I wanted to try this fall. First project I wanted to start this year with my 8th graders came from @JaworskiMusic (Nick Jaworski) whom I’ve recently gotten to know. He has a fabulous blog about music education and teaching. One particular post, Music as Identity, caught my attention. Intentionally, I didn’t listen to a student project Nicholas had posted, but wanted to adapt this project for my students*. Thanks, Nick, for a great idea! This is how I remixed your lesson (now I can listen to your student’s project). * Nick’s students are High School students and mine are in Middle School. Make a 2-3 minute audio collage about the music you like and what you think it says about you. What role does music play in students’ lives? What kind of music affects them or have meaning? How will they express their thoughts in narrative writing? How long were they going to take to edit music and audio recording in GarageBand/Audacity? Could we use songs with explicit words? – Answer: Yes, as this was a project about them. I wanted them to own their project and create something they were going to feel good about. Each student were to bring their 4-5 selections of MP3s to upload into school iMacs. We also planned to get rid of explicit songs so that younger students wouldn’t access them. Do we have to start writing on Google Docs? – Answer: No. But eventually, what you write should be shared with me so that I can give some feedback or assess their progress and for easy access. Wait, what is an audio collage? – Answer: Selections of music pieced together, edited by the students. The narration will either introduce the songs or be playing while the music is playing. I don’t know how to edit songs. – Answer: You will! Let’s get working so that you will learn. chose 4-5 songs they love and reflect who they are. created their narratives on Google Docs. This made it so easy for me to instantaneously check their work and make comments and communicate with them. learned to export MP3 files from their personal collections and import them onto school iTunes. learned to use GarageBand to create and edit the project: trimming mp3s, fading in and out, controlling volume, balancing overall volume. recorded their narrative and edit it to lay it over the edited music tracks. I use H2 Zoom recorder in my classroom. It’s the first generation of the Zoom recorders, but I love using it! Students were free to work on any part of the project during the class times so students needed to manage time well. When they started, it was a usual start: the motivated students started brainstorming, writing down ideas feverishly. And then there was a group of students who sat around, doing very little. The momentum of this project was definitely set by the “busy” guys. I was helping students recording their narratives and occasionally reminding students to work. Some students ended up not having much done (they wrote a couple of sentences on GoogleDocs) by the end of the first class. Why were they not being creative? Did they have too much freedom to explore and learn? By the second and third class, I began to see something interesting. One by one, those not-much-producing students, began to show me what they were working on. After each class, these students went home and worked on their projects at home on their laptops. [N.B. Our school allows students to bring their own from home for school use.] Because they didn’t use the class time, these students worked at home. They edited their narrative and recorded it on their own. Exploration went beyond classroom walls and über cool and creative projects ended up coming from these students. Music reflects a lot about me because it’s what makes my personality. I listen to music whenever I’m on my computer. I listen to music when I am doing homework because it blocks out all other noises and it helps me to concentrate. I can’t say music defines me, but I can say I love to listen to music. It helps me concentrate when I do my homework. Music means a lot to me because my life would be a lot less happier and nicer without it. I love the feeling you get when your favorite song just came on the radio and that rush of needing to belt out the words along with it! Music helps me gain more energy in the morning- it gets me excited for the day. 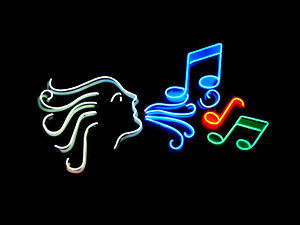 Music makes the world have more pizazz, and is extremely entertaining. Music is important to me in many ways. It brings me up when I’m down. It pumps me up and makes me feel like I can do anything. Music is a must have. It didn’t matter if the student was a girl or boy. For 98% of my students music mattered more than I had expected [one students did not like to listen to music or owned an iPod. We tweaked the project to something he can relate to. I’ll be honest – we struggled a long time to find this tweaked version, but in the end, the student did a fabulous job talking about the role of music]. I discovered how deeply my students were connected to music. I especially loved the way they expressed their identity tied to stories of family and friends. I was also surprised to hear playlists that consist extreme genres from classical to punk rock. Technically speaking, students spent a lot of time editing and learning to use either GarageBand or Audacity. They learned a lot by making mistakes, taking chances, and asking questions. I really liked how many students helped other students when a question was being asked. Needless to say, our two rooms were never quiet (except for recording times). Students’ finished mp3s were loaded up to iTunes. Using SoundCloud, I got an embeddable player so that I can embed it onto the class Google Sites page. Students listened to each other’s collage and gave constructive feedback. Since they all took a long time make these projects, I also wanted to give them a personalized feedback and assessment. I filled out this form and gave each of my students a feed back. I wrote everything in detail except the final grade and asked each student what they learned from this project. Their responses included how excited they were to learn to use GarageBand to create their project. A few were annoyed at how hard they had to work using the application. Some were so surprised to hear what different musical tastes everyone had. A handful of students recommended that I should start next year’s 8th grade year with this project because they had so much fun. I learned so much about my students. I also learned that I need to encourage them to be creative by creating a creative space and time. I’m learning to be patient! My students ARE passionate about music and life. Now what? What am I going to do with this discovery now that I know what huge role music has in their life? How can I channel this passion to help them to learn more about music and guitar (all students learn how to play)? What other ways can I connect with them and learn about what I need to teach them? I’m applying for art school! He is a 35-year-old professional who’s been working as an IT for a very long time. He was the “artist” of the family. Of the handful things my parents opposed in our upbringing, I still, to this day, don’t know why they were [vehemently] against him going to an art school. He obviously had the talent and the drive. He ended up going to a great school in Pitt; life happened – very differently than he had hoped. He put aside his dreams of being a full-time artist and went to work. But it’s amazing how life unfolds. Something drastic happened a year ago at my brother’s job. Amidst mergers, new management, and reconstruction of personnel, a light bulb went off: the hibernating artist started to think about the “what if”s. He moved fast with purpose as he needed to get his portfolio together and get his application in. I am so proud of my brother for trying. Thankfully, he got accepted into a great program in the city (4 years of BFA~ yikes) and loves learning. By all this, I learned that he is brave, hopeful, smarter than ever, and more passionate about his calling. As I get back into the classroom, I am compelled to think about music and my role as a teacher (next blog post). But for now, cheers for my brother & for taking risks!